A “miracle plant” Aloe Vera contains many health and beauty benefits. Its medical properties make it very useful in the cosmetics industry. Aloe Vera is normally applied in the beauty treatments for making skin care products. Because it manages all kind of skin troubles for example scars, pigmentation, marks, dark spots, discoloration, control of excess face oil, dry skin, dark eye circles, rashes, early aging, acne, and other common skin related disease. Using aloe vera gel with other ingredients can make your skin fair and glowing. Today we are ready with some aloe vera face packs for different skin type. 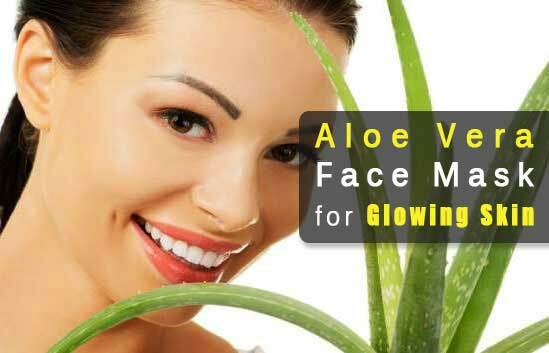 Here are 8 highly useful homemade aloe vera face mask for glowing skin. Select one of them according to your skin type. Aloe Vera is full of antioxidants and vitamin C.
As a skin moisturizer, it can nurture your skin deeply. Work as an anti-aging cream; remove fine lines, wrinkles, and dark spots on the face and skin. It helps to get rid of sun tan naturally. Make a brighter skin tone and get fairness. Take care of insect’s bites, skin disease, wounds, and cuts. Aleo is an incredible natural skin cleanser that takes out darts and impurities from the facial skin. Aloe’s antimicrobial properties heal pimples and red spots, get rid of dark scars, spots, discoloration, and marks on the face. It helps to get back real skin tone, carrying fairness and glowing on the face. Soothe dry skin quickly. It helps to decrease skin redness, rashes, and inflammation. Cure skin infection, get rid of excess dirt, and oil from the face. Here are 8 highly useful homemade Aloe Vera face mask for glowing Skin that you can make at home. Regular use of this aloe vera face mask can make your skin beautiful. You can also store them it in your refrigerator. Mix all the ingredients for your requirements. Calmly use this paste over your face. Rinse it off with using water and dry it using a soft towel. This aloe vera face pack holds all basic ingredients to improve your skin tone. Vitamin C in aloe vera gel encourages collagen creation and brings fairness to the skin. Milk helps in moisturizing the skin and makes it more bright and perfect. Rinse it off with normal water and dry it using a soft towel. Follow this mixture for 3 days weekly to remove acne/pimples. The anti-inflammatory properties of raw honey can stop the inflammation, redness of acne and pimples. It nurtures the dry skin about pimples. If you follow this remedy on a regular basis, you will be able to remove acne and pimples for achieving a clear skin tone. After mixing all the ingredients properly, use this solution over your face and massage lightly. Keep them for at least 20 minutes. Rinse it off with water and dry it using a soft towel. Use this mixture 1 time in every 2 days to get white skin tone. You can also add a little bit of turmeric to get extra fairness and glow to your skin. Use this aloe vera face pack before taking bath. It will help you to get the bright, fair, and beautiful skin. Every ingredient of this mixture helps to give fair skin tone even as removing dark spots, scars, and pigmentation. It also helps to improve skin flexibility and you will look younger and fresh than previous. Blend all of these ingredients for making a smooth paste. Rinse it off with cold water to remove the dry skin. You can also store this solution in the refrigerator for a long time. You must be kept this solution in an airtight container. Your faces wrinkles and fine lines happen for Dryness. A person with dryness on the skin requires moisturizing their skin in each hour. Using this pack regularly can moisturize and nourish your skin and help to get a glowing face. Mix these 2 ingredients to get a watery solution. Lightly massage this paste on the affected area of skin. Rinse it off with using normal water to remove the skin tan. Sun can make your skin damage and appear to dull. Bleaching property of lemon juice gets rid of the dark dead skin cells from the face. Simultaneously, aloe vera gel moisturizes and nourishes the dry skin. You can also include a little bit of turmeric to get extra fairness over the face. Regularly using this mask can help you removing sun tan absolutely and make your skin tone more fair, shining and soft. Rinse it off using cold water to remove the skin tan. This face mask incredibly helps to get rid of dirt, oil from the facial skin, make it cleaner and refreshing. Cucumber juice for sensitive skin is a great selection. Mix both of these ingredients in an airtight container. Gently use this solution over your skin after cleansing and toning. You can use this moisturizer 2 times daily. Acne and pimples mostly occur from oily skin. Tea tree oil is great for removing excess oil, dirt, and dust from skin holes. This mask cleans the skin holes and makes them shrinks. Massaging this face pack regularly can control excess face oil. Mix these ingredients to make this face scrub. Lightly massage this paste over your face and neck. Dirt, pollution covers your skin with dead cells and makes it dark. This Aloe Vera Face Scrub helps to get rid of dead skin cells from the face and neck naturally. You can do this 2 times weekly. Clean aloe vera leaves using fresh water, after arranging from the plant. Don’t try to use the aloe vera gel that contacts to sunlight and air, because it will get spoiled. So try to use the gel when extracting out instantly. Don’t take the yellow liquid from the aloe vera leaves that come out while extracting gel, as it’s poisonous naturally. You can also eat aloe vera gel directly, however only 2 tablespoons daily. Using aloe vera gel directly can make skin irritation if someone has sensitive skin type. So dilute it with water before using. If you want to store the gel, don’t mix water; include water only while you use it. Children under 12 should not take aloe vera gel. Pregnant women should not take aloe vera.